Over P200,000 in cash prizes and the chance to represent the country in one of the most prestigious PlayerUnkown’s Battlegrounds competitions in Pan Asia Pacific were at stake in the Predator League PUBG Philippine Finals on Jan. 26 at the High Grounds Café and Jan. 27 at Glorietta Activity Center. 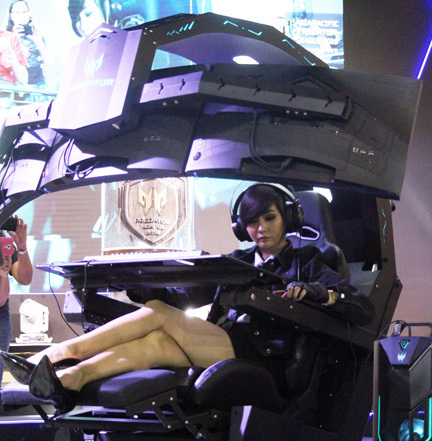 Influencer Alodia Gosiengfiao tests the Predator Thronos Gaming Chair. The Predator Thronos Gaming Chair was also revealed during the competition. A total of 16 top teams from all over the Philippines—Team No Future, Miraculum, TNC, ArkAngel, Anonymous Ilonggos, Nirvana, Vulture Gaming, Mistah, DPT, AdMiral, Ronin, 5peaks, Patriots, Vortexfarm, NCGC Vortex, and Bosons—competed for the Philippine championship title. ArkAngel, the team with the highest score won, determined by a pointing system with a total of 12 action-packed rounds. The team will represent the Philippines at the Predator League Finals 2019 in Thailand on Feb. 15 —17, for a chance to get a slice of the US400,000 pool prize. Predator has the most complete line of gaming devices ranging from laptops, desktops, and monitors with the latest technologies, enhancing the eSports community’s gaming experience—truly the best gaming monitor in the market. Predator Thronos is customizable depending on the gamer’s preference. Its CPU is interchangeable from POS-610 RGB, PO9-500 RGB to the best option P09-900 RGB and its monitor from Nitro XV272U P, Nitro XV273K P to the much-raved Predator XB273K. Predator offers three packages with SRP starting at P699,999.